We are excited to announce another date for our Mum Club Breakfast Club at Kings head Spratton in Northampton with our lovely hostess with the mostess Georgia!! The last breakfasts have been such a success, a perfect morning of girl time and great food with a few babies thrown in. You will recognise Georgia if you have ever visited a Northampton TMC event before. The effortlessly fabulous Bristol born Mum of 1 year old Olivia, is a freelance broadcast journalist and is now living in Northampton. Georgia has also co founded her own business ; Belle Fleur Events, along side raising her family. And if all that wasn’t enough she is becoming our Northampton events host, WOOWOO! She manages to do all this without a hair out of place! We give to you QUEEN Georgia !! A feast of finger foods, ideal for those with only one hand to spare. This event is designed for like minded mums or mums-to-be and friends, to come together with a morning off to eat some delicious healthy food whilst getting to speak to other adults yey!!!! Babes in arms are welcome but please keep in mind there is limited space for buggies in the cafe. FINALLY.. evening events are back with a BANG! The Mum Club has joined forces with this fabulous duo at No.34 Beauty to bring you and evening of indulgence at their brand spanking new studio. Ruth; Queen of skincare and Semi-Permanent Makeup, and Aimee; Award winning Makeup Artist and Lash & Brow Guru have tailored made an essential skincare routine and a quick 5 minute makeup look, because who has anymore than 5 minutes in the morning? This less is more routine has been carefully curated to make us look like we really are a little less tired, combining all their areas of expertise and with mums just like YOU in mind. Champagne will be chilled, a grazing table of dreams and endless expert advice on how to look a bit less tired! So book the sitter, call your girls and come along. Your ticket includes an evening of expert advice at No.34 Beauty, bubbles on ice or soft drink alternatives, food provided in the style of a grazing table * please let us know prior to the event of any dietary requirements* An extra special TMC pouch and Aimee and Ruth have kindly offered some exclusive discounts to TMC members and will be on hand to answer any of your Makeup and skincare questions on the evening. *Parking- Please note that there is street parking along PALMERSTON ROAD. If you are disabled please let us know beforehand and we can arrange for you to use the private car park. Once at the premises you will find us in the far left building and No.34 door down the path to your left. We are excited to announce another date for our Mum Club Breakfast Club at Cafe Marseille in Northampton and with our host Georgia!! The last breakfasts have been such a success, a perfect morning of girl time and great food with a few babies thrown in. Delicious food, goodie bags and even better company. You will recognise Georgia if you have ever visited a Northampton TMC event before. 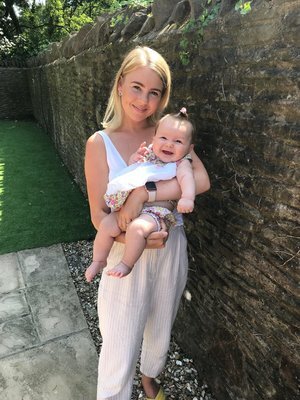 The effortlessly fabulous Bristol born Mum of 8 month old Olivia, is a freelance broadcast journalist and is now living in Northampton. Georgia has also co founded her own business ; Belle Fleur Events, along side raising her family. And if all that wasn’t enough she is becoming our Northampton events host, WOOWOO! She manages to do all this without a hair out of place! We give to you QUEEN Georgia !! Come join us train with Hannah at Move4Physio in a group work out. Bring the babies or leave them with dad and head over to Move 4 Physio for a group work out. Meet some like minded mums and get in some ME TIME!!! Fill in the form below to be included into our Northampton Fit Club WhatsApp group. We are excited to announce another date for our Mum Club Breakfast Club at Ten Hands Cafe in Towcester and this time with a brand new host!! The last breakfasts have been such a success, a perfect morning of girl time and great food with a few babies thrown in. With it being the beginning of a new year we have gone for a health kick vibe with some treats added in too. Includes a hot or soft drink, we will also give all TMC members a fully loaded hot drinks loyalty card for a return visit with us. On the back of last years success we are running our Wreath Making evenings again this year!!! These are our favourite events and sell our FAST!! Turns out you all love Christmas as much as us!!! The tutorial will start prompt at 7.15pm, and you should be done by 10pm. !! !THIS IS FOR A PRIVATE CHRISTMAS PARTY PLEASE DO NOT PURCHASE TICKETS UNLESS YOU ARE PART OF THE ST ANDREW CHRISTMAS PARTY!!! !! !THIS IS FOR A PRIVATE CHRISTMAS PARTY PLEASE DO NOT PURCHASE TICKETS UNLESS YOU ARE PART OF THE SAINTS CHRISTMAS PARTY!! !